Divine on stage and screen. Between films for John Waters, Divine acted in many other projects, both on stage and in films. Many of the stage performances were either never recorded on film, or if they were, are very hard to find these days. 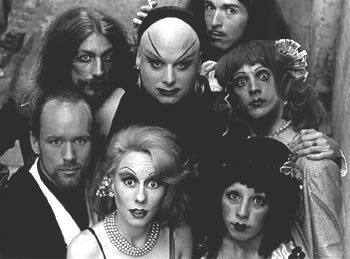 Performed with a stage troupe in San Francisco called The Cockettes in such productions as Divine and the Stimulating Studs, Divine Saves the World, Vice Palace, Ladies in Retirement, Journey to the Center of Uranus and The Heartbreak of Psoriasis. There is a marvelous documentary about the Cockettes featuring footage of John Waters and Divine. It's a must see. A parody of women prison movies, this stage comedy starred Divine in the role of Pauline, the Matron of the Womens House of Detention. It was very successful in New York and eventually played to audiences in London in 1977. Divine was flown to London to participate in the Alternative Miss World Contest which was filmed and eventually premiered in London, for which Divine was the guest of honor. Described by Divine as follows: "Once a year, on the same night as the Miss World Pageant in London, my friend Andrew Logan - who is a poor Andy Warhol of London - gives a mock Miss World contest. It is not a drag show. Men, women and children are in it. The categories are Day Wear, Evening Wear, Bathing Suits, and Questions and Answers. The contestants put much time into their costumes, which included that year outer-space beasts and boxes of chocolates." Tom Eyen wrote this sequel to Women Behind Bars especially for Divine. It opened successfully in New York and toured to San Francisco as well. Tom Eyen went on to write for the TV sit-com Mary Hartman, Mary Hartman, and the Broadway production of Dreamgirls. A documentary about New York underground legend Tally Brown by infamous German queer director vonPraunheim, this movie has been described as "the first of Rosa's wild, unpredictable portraits of aging dancers and cabaret stars. Here he follows the almost-legendary Tally Brown through the subterranean bowels of late 70's New York." The movie also features Warhol superstars Taylor Meade and Holly Woodlawn. Also starring Tab Hunter, Laine Kazan, Cesar Romero, Geoffrey Lewis, Henry Silva and Nedra Volz. 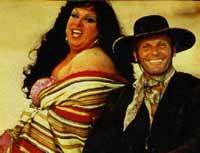 After their pairing in Polyester, Divine and Tab Hunter starred together again in this western spoof. Also starring Laine Kazan as Divine's rival. An obvious cult classic from the director of Eating Raoul. Also starring Keith Carradine, Genevieve Bujold, Kris Kristofferson and Lori Singer. This contemporary film-noir featured Divine as Hilly Blue -- out of drag -- as a powerful gangster in a fictitious city. Divine guest starred in an episode of this television series titled "Seymourlama." 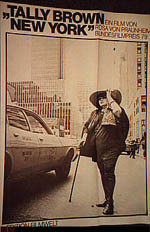 Divine had a cameo role as an LA detective in this, his final film appearance. It features other performers from the Lust in the Dust cast, including producer Paul Bartel who dedicated the film to Divine.